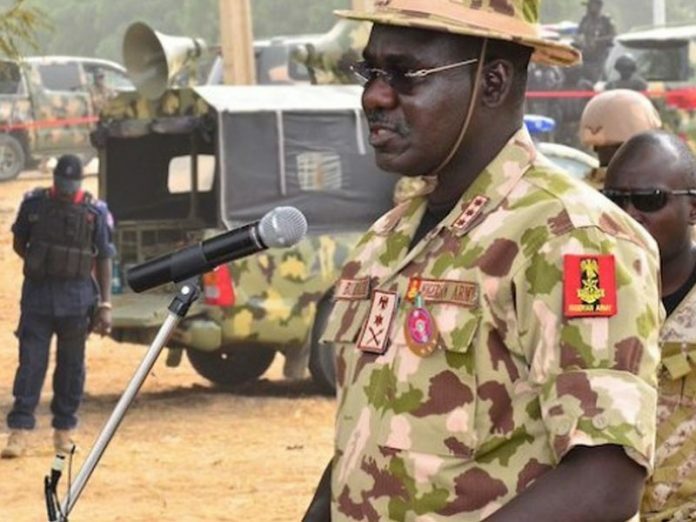 Apparently determined to exterminate the deadly terrorist group, Boko Haram, in the North-east, the Chief of Army Staff, Lt.-Gen. Tukur Buratai, said Thursday that some of the newly promoted senior officers will be moved to the theatre of war to strengthen the ongoing counter-terrorism operations. Buratai stated this in Abuja, after he decorated the 29 newly promoted Major Generals and some of the Brigadier Generals with their new ranks. According to him, “Some of you that have been promoted and decorated today; we are only waiting for today and by tomorrow, I expect you to pick your bags and start heading towards the North East. Buratai appealed to the wives of the affected officers deployed in the theatre of operation to keep the home front well while their husbands would be there. He described the promotion as well deserved, saying it was a journey they started many years and had culminated in current enviable ranks of major generals and brigadier generals. The Army Council recently approved the promotion of 231 senior officers to the next ranks. While 29 Brigadier-Generals were elevated to Major-Generals, 95 Colonels to Brigadier-Generals, 106 Lieutenant Colonels to Colonels, one was promoted from Major to Lieutenant Colonel. The army authority said the promotion was to re-energise the beneficiaries toward the discharge of their tasks and responsibilities.